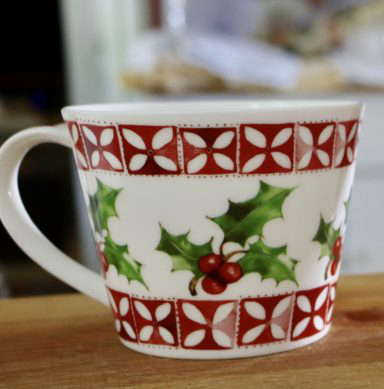 Lovely collectible Susan Branch Cup, stamped on the bottom "Fine Bone China, Made in England." Imported from "the potteries" in Staffordshire, England; It fits between the other two sizes, it's 14 oz, and wider at the top. We think different sizes add to shelf cuteness. Susan's charming art on front, back, handle, and bottom of each cup. Dishwasher and Microwave Safe.